Born in Barcelona in 1932, Martin moved to Mexico and started working at the Galas de Mexico printshop in 1952. This shop specialized in making cigarrette packages, matchboxes and calendars for which superb realists such as Jesus Helguera and Angel Martin would provide illustrations. After 9 months at Gala he had a big enough reputation that he could leave the shop to provide paintings for them and other printmakers. 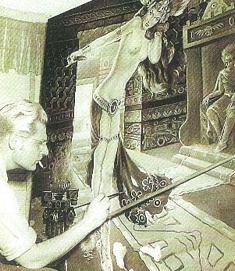 Most of his paintings dealt with propaganda, political and religious. In 1976 Santiago Galas sold 60% of his company to Grupo Carso headed by Carlos Slim who acquired many of the original paintings made for the shop. In recent years Angel Martin has been working themes related to Don Quijote, nudes and mythology. 12 of his works are part of the Soumaya and Telmex museums in Mexico City.